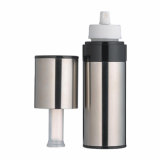 Plastic atomiser with pump mist spray function - 100ml capacity (nominal). Overflow bottle max size is 116ml. Cylindrical food grade clear PET plastic bottle with protective cap. The spray cap is made from white polypropylene with a protective overcap for secure non-leak transportation. Suitable for use with foods - not suitable for organic solvents. When tightened down the spray head provides an airtght and leakproof seal to the bottle. Spray Head Dia 20mm (internal). Spray tube is 175mm - you can trim down or leave curled in the bottle. Do not use near a barbecue or naked flame as the spray may ignite.